Wolf Lieser is the director of DAM, a veteran art gallery in Berlin which has focused for more than fifteen years on the use of digital media in contemporary art, from the pioneers of computer art in the 1960s to the younger generation of artists working and reflecting on digital culture. Five years after our first interview (published in art.es #39-40, 2009), I meet again with the gallerist and author of the book “The World of Digital Art” (H.F. Ullmann, 2010) at Barcomi’s in the district of Mitte. In our conversation, Lieser comments on the recent developments of the art market and offers a glimpse of the future of digital art. It seems that finally new media art is going mainstream, but not in the way it could be expected. Instead of well-known names, it is a generation of young artists who are attracting attention, mostly under the label “Post-Internet Art”. What do you think about these emerging artists? First of all what comes to mind is that they have a totally different perspective from the previous generations, they haven’t had to struggle for decades to be accepted. They are now experiencing a phase where the market is realizing Digital Art is something innovative and new, exciting, flashy. So, some of these new “stars” are not necessarily better than others –from my perspective– but it seems to be an indicator of a broader acceptance of this medium. The interesting thing is as well that several international curators now feel like they have to pick up on “Post-Internet Art” because it’s so hip right now. Post-Internet embraces the new generation of digital natives. Many of these don’t seem to be aware of the history of digital art. It’s the result of a new trend that has finally gone mainstream due to the fact that in our daily life the computer is omnipresent and is impacting on society: this genre cannot be ignored any longer. Another consequence of this increased recognition is that Digital Art is getting commercialized, which, from my perspective as a gallery owner who has supported this art for more than a decade, is not only positive, but it is how part of the art world operates. Once the market observes that there is some money to make, more money-oriented people get involved, people who invest in these artists. And there are new galleries who are following this strategy, now supporting these artists, who appear in auctions –even before they’ve had a few shows in galleries– and they are getting high results, which of course attracts further galleries… It’s a phenomenon that I have observed in the US and Europe. This is due to a general change that the art market is experiencing. However, it is not only the young artists who are getting more attention. Major museums are beginning to collect the work of important pioneers like Manfred Mohr and Vera Molnar, whom I have supported with my gallery over the last ten years. They are experiencing well earned recognition and are selling well. But still, there is this situation that, for instance, an original plotter drawing from Vera Molnar from the seventies, a unique piece, costs less then a lenticular “painting” from Rafael Rozendaal from last year. This is odd, but on the other hand, that’s how the market works. I prefer to support artists on a long term plan, for instance Aram Bartholl, who has a different attitude and approach to his work and the market, a more serious one in my opinion. In general, I have developed my program including the younger generation, but with the perspective of the previous generations. Newer artists of the gallery are Kim Asendorf and Flavien Théry, in whose work I see a new conceptual and aesthetic approach. Therefore, besides the recognition in the mainstream contemporary art world, there is a change of mentality, apparently more market-oriented. Yes, I think that some of these artists are aiming towards a market-oriented strategy. Some became well known for really being innovative by selling websites or YouTube videos. Many people identified with this kind of work and it spread. And then in the end they produced “Photoshop paintings” or “Lenticular Paintings”, which don’t have a lot to do with their original art anymore. It feels like a move towards the art market. New galleries such as XPO, Carroll/Fletcher, or Transfer have a different attitude towards Digital Art, in the sense that they do not identify their program with this label. It’s a different strategy, that’s true. But they are only a few years old and they started when Digital Art was already successful with some artists like Manfred Mohr or Rafael Lozano-Hemmer. No need to be a pioneer or to concentrate on one specific medium. So it’s about which game you would like to play, and if you want to be a successful gallery as soon as possible, then there are some things you have to do. I have a very personal career in this respect because I was considered an outsider for a long time, which resulted beside other things to be refused at art fairs. My program was not taken seriously, and it is still like that to some degree in Berlin. But to run with the pack was never my priority. Positioning the gallery in field of the digital was definitely, sales-wise and marketing-wise, as well as in the art market, a disadvantage at the beginning. It is not considered to be the thing you should do as a gallery. Now I’m internationally renowned for that. Even naming a gallery DAM was considered a no go. How I see it now is, that such a concept that I did create more than 15 years ago, combining an online museum and a lifetime award with a commercial gallery, that will probably not happen again. Because it doesn’t make sense anymore in the present art market context. It is something which is, to some degree, old fashioned –or, as a friend of mine once called it, romantic. Still it has for me its strong advantages, which I wouldn’t want to miss, as it did connect the history of digital art with its present tendencies. That is a major advantage and of course I have the knowledge as well as the experience in the field, which you just can’t buy. That makes my job so much more fulfilling. 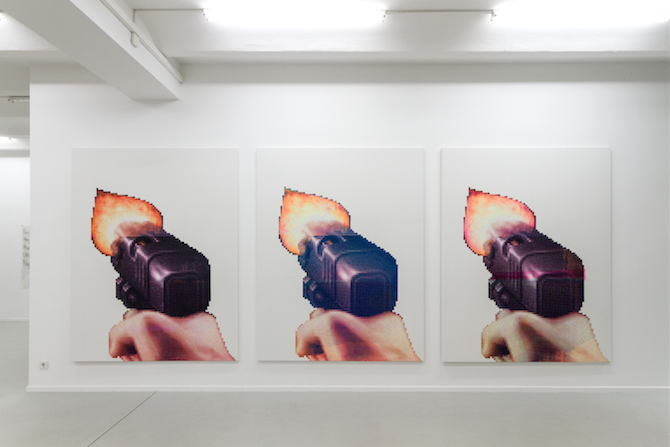 Besides the galleries, there are other platforms selling digital or screen-based art, such as Sedition, which sells digital editions of artworks. Do you think that this model can succeed? Yes, I think that selling digital editions can be an option for an artist. I already mentioned this in my book on Digital Art, where I included the work of LIA , who is selling with Sedition and through the Apple Store. I am not convinced about Sedition in regards to art because it is a mostly commercial approach, their strategy is based on names, not so much on quality of art. Why would you want to buy a JPEG of Damien Hirst, seriously? Having a platform for selling, renting or streaming artworks is an interesting business line in the future, but I think that it is really necessary to go beyond the flashy appearance. It could be an easy, accessible way to allow people to get involved with this kind of art, and that they understand at the same time its specific rules and aesthetics. But the way software art is presented in Sedition is confusing, it’s a video, a looping excerpt of a larger and more complex artwork, but someone buying the $25 edition might not be aware of that. On the other hand it can’t be denied that a increasingly larger part of society in this century will move more towards a nomad life, so many of our cultural artefacts will be in a digital format which we can carry around or just store in a cloud. We are developing a different attitude towards books, films and art that will be closer to how we consume music nowadays. So there is definitely a market developing in this field, a really broad one where more and more is in digital format. That seems obvious. You have a new space in Berlin, after closing your sister galleries in Cologne and Frankfurt. What will be the next development of DAM Gallery? I decided to close the other galleries due to the changing market situation. I opened those spaces because I have customers in those areas, and I felt it is important to give them the possibility to see the whole range of work of an artist, not just one or two pieces at an art fair. But in general people visit galleries less and less. They inform themselves on the web. So if you take aside actual mainstream exhibitions of well known artists, you have not many visitors in the galleries anymore. Therefore, more galleries are moving into smaller spaces, take part in more art fairs, which is an easier way to reach potential buyers. Observing all this, I have decided to keep a base in Berlin and get involved with more art fairs, as well specialized fairs, where you meet more selective collectors. Because after all, I would like to get more art lovers to get excited about this kind of work! Wolf Lieser es el director de DAM, una veterana galería de arte en Berlín que se ha centrado durante más de quince años en el uso de tecnologías digitales en el arte contemporáneo, desde los pioneros del computer art en los años 60 a la joven generación de artistas que exploran la cultura digital. Cinco años después de nuestra primera entrevista (publicada en art.es #39-40, 2009), vuelvo a encontrarme con el galerista y autor del libro “Arte Digital. Nuevos caminos en el arte” (H.F.Ullmann, 2010) en Barcomi’s, en el barrio de Mitte. En nuestra conversación, Lieser comenta el reciente desarrollo del mercado del arte y ofrece pistas sobre el futuro del arte digital. Parece que finalmente el arte digital se integra en el mundo del arte contemporáneo, pero no como se esperaba. En vez de nombres conocidos, es una generación de jóvenes artistas la que está acaparando la atención, principalmente bajo la etiqueta “Post-Internet Art”. ¿Qué opina de estos artistas emergentes? Lo primero que me viene a la mente es que tienen una perspectiva totalmente diferente de la de las generaciones anteriores, no han tenido que luchar durante décadas para ser aceptados. Están experimentando una fase en la que mercado ha descubierto que el arte digital es algo innovador, nuevo, excitante, llamativo. Así que algunas de estas nuevas “estrellas” no son necesariamente mejores que otros artistas (desde mi perspectiva), si bien son un indicador de una mayor aceptación de este medio. Lo interesante es que varios comisarios internacionales sienten que deben apuntarse al “Post-Internet Art” porque está de moda. El “Post-Internet” reúne a una generación de nativos digitales, muchos de los cuales no parecen conocer la historia del arte digital. Es el resultado de una nueva tendencia que finalmente llega al gran público debido a que en nuestra vida diaria los ordenadores son omnipresentes y también lo es su impacto en la sociedad: este género ya no puede ser ignorado. Otra consecuencia de este creciente reconocimiento es que el arte digital está siendo comercializado, lo cual, desde mi perspectiva como galerista que ha apoyado este arte durante más de una década, no sólo es positivo, sino que es la manera en que opera parte del mundo del arte. En cuanto el mercado ve que este arte es rentable, más personas centradas en el dinero se interesan e invierten en estos artistas. Y hay nuevas galerías que siguen esta estrategia: ahora apoyan a estos artistas, cuya obra se presenta en subastas (incluso antes de haber tenido unas cuantas exposiciones en galerías) y genera grandes beneficios, lo cual, por supuesto, atrae a otras galerías… Es un fenómeno que he observado en EE.UU. y Europa, y se debe a un cambio general que está experimentando el mercado del arte. Con todo, no sólo los artistas jóvenes reciben más reconocimiento. Grandes museos están empezando a coleccionar la obra de pioneros clave como Manfred Mohr y Vera Molnar, a quienes he apoyado desde mi galería durante los últimos diez años. Están experimentando un merecido reconocimiento y venden bien. Con todo, sigue dándose el caso en que, por ejemplo, un dibujo original en plotter de Vera Molnar de los años 70, una pieza única, cuesta menos que una “pintura” lenticular de Rafael Rozendaal del año pasado. Esto es extraño, pero de hecho así es como funciona el mercado. Yo prefiero apoyar a los artistas a largo plazo, como por ejemplo Aram Bartholl, quien tiene una visión diferente de su obra en relación al mercado, más seria en mi opinión. En general, he desarrollado mi programa incluyendo a la generación más joven pero con la perspectiva de las generaciones anteriores. Kim Asendorf y Flavien Théry son nuevos artistas de la galería: veo en su trabajo un enfoque estético y conceptual innovador. Por tanto, a parte del reconocimiento por parte del mundo del arte contemporáneo, hay un cambio de mentalidad, aparentemente más dirigido hacia el mercado. Sí, creo que algunos de estos artistas apuntan hacia una estrategia dirigida al mercado. Algunos se han dado a conocer por ser realmente innovadores al vender sitios web o vídeos de YouTube. Mucha gente se ha identificado con este tipo de obra, que ha llegado a popularizarse. Y así, finalmente han producido “pinturas de Photoshop” o “pinturas lenticulares”, que no tienen mucho que ver con su trabajo original. Da la impresión de ser un paso hacia el mercado. Nuevas galerías como XPO, Carroll/Fletcher, o Transfer tienen un enfoque diferente del arte digital, puesto que no identifican su programa con esta etiqueta. Es una estrategia diferente, eso es cierto. Pero estas galerías abrieron hace pocos años y por tanto han empezado cuando el arte digital ya tenía éxito gracias a artistas como Manfred Mohr o Rafael Lozano-Hemmer. No es preciso ya ser un pionero o centrarse en un medio específico. Así que se trata de qué juego estás dispuesto a jugar, y si quieres tener una galería exitosa lo más rápido posible, entonces hay algunas cosas que debes hacer. En este aspecto, tengo una carrera muy personal porque se me ha considerado un outsider durante mucho tiempo, lo que ha supuesto entre otras cosas que me rechazaran en las ferias de arte. Mi programa no se tomaba en serio, y esto sigue siendo así, hasta cierto punto, en Berlín. Pero nunca ha sido mi prioridad seguir a la manada. Posicionar la galería en el ámbito del arte digital era definitivamente, tanto a nivel de ventas, marketing y del mercado, una desventaja desde el principio. Se supone que no es lo que uno debe hacer como galería, pero ahora se me conoce a nivel internacional por ello. Incluso nombrar la galería “DAM” se consideraba un error. Ahora veo que el concepto que creé hace 15 años, al combinar un museo online y un premio honorífico con una galería comercial, seguramente no se repetirá. Porque ya no tiene sentido en el contexto actual del mercado del arte. Es algo que es, hasta cierto punto, anticuado o, como lo definió un amigo mío, romántico. Con todo, para mí comporta fuertes ventajas que no me gustaría perder, puesto que me ha servido para conectar la historia del arte digital con sus tendencias actuales. Esta es una ventaja importante y por supuesto tengo el conocimiento además de la experiencia profesional, que es algo que no se puede comprar. Esto hace que mi trabajo sea mucho más satisfactorio. Además de las galerías, hay otras plataformas de venta de arte digital o audiovisual, como Sedition, que vende ediciones digitales de obras de arte. ¿Cree que este modelo puede ser exitoso? Sí, creo que vender ediciones digitales puede ser una opción para un artista. Ya mencioné esto en mi libro acerca del arte digital, en el que incluyo la obra de LIA, quien vende en Sedition y en la Apple Store. No me convence Sedition en relación al arte porque su enfoque es principalmente comercial, su estrategia se basa en nombres y no en la calidad de las obras. En serio, ¿para qué querría uno comprar un JPEG de Damien Hirst? Una plataforma de venta, alquiler o streaming de obras de arte es un modelo de negocio interesante para el futuro, pero creo que es necesario ir más allá de lo meramente llamativo. Podría ser una manera fácil y accesible de permitir que el público conozca este tipo de arte, y que entiendan su estética y reglas específicas. Pero la manera en que se presenta el software art en Sedition crea confusión: es un vídeo, un extracto en bucle de una obra más grande y compleja, pero alguien que compre la edición de 25 dólares tal vez no lo sepa. Por otra parte, no puede negarse que en este siglo una parte cada vez mayor de la sociedad va a llevar una vida más nómada, de manera que muchos de nuestros artefactos culturales tendrán un formato digital que podemos llevar con nosotros o almacenar en la nube. Nuestra percepción de los libros, el cine y el arte está cambiando y se acerca a la manera en que consumimos música actualmente. Así que, definitivamente, se está desarrollando un mercado en este ámbito, uno particularmente amplio en el que cada vez más cosas están en formato digital. Esto me parece obvio. Tiene usted un nuevo espacio en Berlín, tras cerrar las galerías en Colonia y Frankfurt. ¿Cómo se desarrollará la trayectoria de DAM en el futuro? He decidido cerrar las otras galerías a causa de los cambios en el mercado. Abrí esos espacios porque tengo clientes en esas ciudades y pensé que era importante darles la posibilidad de ver todo el conjunto de la obra de un artista, no sólo una o dos obras en una feria de arte. Pero en general la gente visita las galerías cada vez menos. Se informan en la web. Así que, descartando las grandes exposiciones de artistas conocidos, ya no se ven muchos visitantes en las galerías. Por tanto, cada vez más galerías se trasladan a espacios más pequeños y participan en más ferias de arte, lo cual es un modo más sencillo de acceder a potenciales compradores. Observando todo esto, he decidido mantener una base en Berlín y participar en más ferias de arte, así como en ferias especializadas, en las que se conocen coleccionistas más selectivos. Porque, después de todo, ¡me gustaría que más amantes del arte se entusiasmen con este tipo de obras!